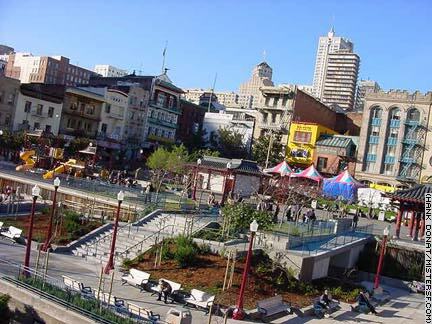 Portsmouth Square at Clay and Kearny Streets is the hub of social activity in Chinatown. Because this area is one of the most densely populated neighborhoods in the country, many of its residents live in one room apartments. Portsmouth Square has served as Chinatown's living room since the mid-1800s and just underwent a $3.9 million face lift. Kids can enjoy two new play areas here. Other additions include a community room, benches, game tables, landscaping, and more. Once only 500 feet from the water's edge, this is the site where John B. Montgomery, captain of the U.S.S. Portsmouth, first raised the American flag in San Francisco in 1846. Portsmouth Square is also the site of the first public school in California.